You might wonder how a person can accidentally buy diamonds, well for starters, it helps to be in LA. It happened on the way home from a lovely Arizona Christmas. I had a layover at LAX and decided to do a little browsing through the shops. I found a store full of watches and one of them really caught my eye. It was classic and elegant and when I picked it up I noticed that it really caught the light well. It sparkled. I had been thinking about getting a new watch. I have one that I love but no one can get the back off of it to put a new battery in. It has given me a good few years of service but I thought it might be time for a new one. 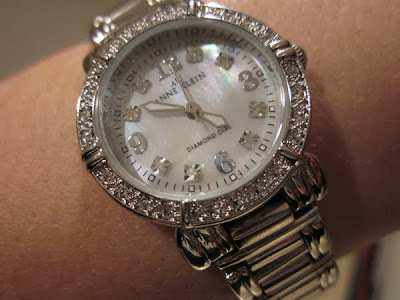 The sparkly watch was $95 so I put it back and kept looking. I walked around some more but the idea of the watch wouldn’t leave me alone. I started thinking about this past year and how the idea of sparkling was a thread that ran through it. Early in the year I read a quote that said “On the bad days you need to sparkle harder” and then months later a friend told me “in general, people greatly underestimate their need for sparkle.” As the year progressed I had, and took, the opportunity to sparkle both literally and figuratively. I am a sucker for a good metaphor and I kept thinking what a great reminder that watch would be - a way to actually make the hours sparkle as a reminder to myself to always be on the lookout for the good amid the usual. With fifteen minutes left before I needed to board the plan I went back and got the watch. It still sparkled and the mother of pearl face cast little shimmery rainbows if you held it just right. I decided it would be my Christmas present to myself. Imagine my surprise when I took the watch out the next day and saw the words “diamond dial” on the watch face. I took out the instructions and to my great surprise discovered that what I thought were cubic zirconia in the bezel and on the face are actually real diamonds. No wonder it caught the light so well! In truth, they are very tiny diamonds, which is why the price wasn’t higher, but they are real diamonds all the same. The first diamonds I have ever owned. Now I have not only a perfect reminder to make the hours sparkle, I also have a reminder that sometimes God surprises us with even more than we know, more than we hoped for. Sometimes he gives us the things we hadn’t even thought to dream of. I wonder what other delightful surprises are lurking in 2011? I can’t wait to find out.